Many shoppers will attest that the New York Diamond District still remains one of the world’s top destinations for engagement rings and fine diamond jewelry at tremendous value. However, with nearly 2,600 jewelry retailers, manufacturers and dealers condensed within a one block radius, navigating through the hustle and bustle to find the best deals and the most reputable jewelers can be a challenge for some. 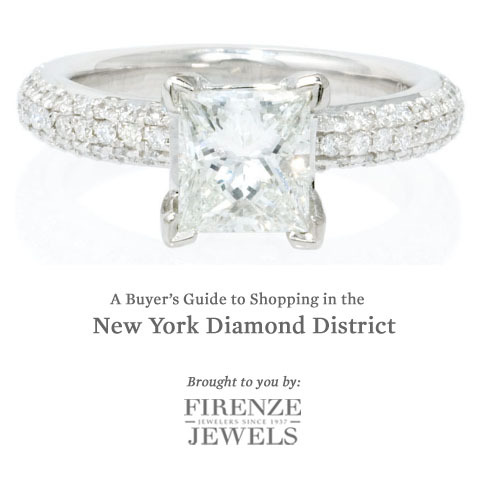 As long time Diamond District jewelers and with Firenze Jewels’ Jeffrey Levin serving as chairman of the 47th St BID for 16 consecutive years, we’ve created this guide to offer unique insight into shopping at the world’s famed diamond center. If you haven’t done so already, you’re going to want to familiarize yourself with The 4 C’s. These are the fundamentals to finding the best quality diamond within your budget. Some shops in the Diamond District also have websites where most of their jewelry inventory is displayed. Use them to your advantage. Read about a store’s policies, how long they’ve been in business and their Better Business Bureau accreditation. View the styles of jewelry and rings they carry to get a sense of what you’re looking for (halo? antique style? pavé?). A few stores also display loose diamond inventory online. If you find something that interests you, be sure to make an appointment in advance to reserve the diamond(s) for a private viewing as many times they aren’t readily available on the premises. This will save you time. Upon arrival, it’s easy to get a little overwhelmed. Have a list handy of the merchants you’ve researched and thoroughly vetted. Feel free to glance at other stores that catch your fancy, but keep in mind that policies vary from shop to shop. Are all their diamonds 100% natural? What’s the jeweler’s stance on ethical diamond sourcing? What trade organizations do they belong to? During your visit, don’t be lured by signs such as “50% off”, “Wholesale to the Public”, “Discounted Prices” ect.. As the old adage goes: “If it sounds too good to be true, it probably is”. The only way of really knowing if you got a good deal is to shop comparable items and ask questions. Always go with your gut instinct. Don’t do business with hawkers. It’s no secret; on occasion, the Diamond District has received negative press about salespeople who openly solicit shoppers on the sidewalk. You’ll find them as much of a nuisance as we do. It’s been an on-going conflict in the area. On the same note, avoid aggressive salespeople you may encounter. If at any point in time you feel uncomfortable, simply move on to the next shop or exchange. Be certain the diamond you’re buying is certified by a renowned grading institution such as the Gemological Institute of America (G.I.A) or European Gemological Laboratory (E.G.L.). Familiarize yourself with what the certifications should look like. At any shop you visit, a jeweler should be able to provide you with at least a 10x magnification loupe or microscope. Upon examining the diamond, verify that inclusions (if any) correlate with what is shown on the certificate. Have a written copy of the store’s return or exchange policy. For an honest third party appraisal, be sure to find a truly independent appraiser who is not connected with any diamond sellers and does not sell diamond or jewelry. Lastly, it’s important to obtain a copy of the jeweler’s appraisal (normally provided free of charge) and insist the merchant put all jewelry claims on the sales slip. We hope the information above helps in your Diamond District shopping experience and makes the whole engagement ring buying process a little less intimidating. Happy diamond hunting!